May the Holy Spirit, therefore, enlighten us so that no one may have a perverse heart: a hard heart, which will lead you to faintheartedness; a stubborn heart that will lead you to rebellion, that will lead you to ideology; a heart that is seduced, a slave to seduction, that will make you Christians of compromise. Vatican City (AsiaNews) - “Take care, brothers, that none of you may have an evil and unfaithful heart, so as to forsake the living God.” This is the harsh “message”, the “warning” as Pope Francis calls it, that the author of the Letter to the Hebrews addresses to the Christian community in today’s liturgy. 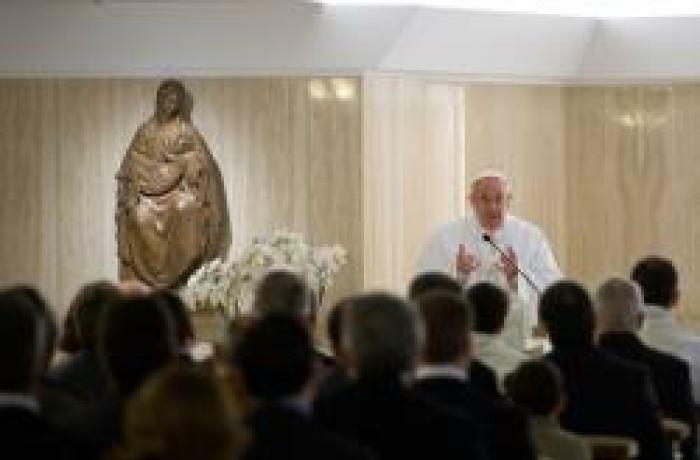 The Pope warns that the Christian community, in all its components - “priests, nuns, bishops” - runs this danger of “slipping towards a perverse heart”. But what does this warning mean to us? The Pope focuses on three words, again taken from the First Reading, which can help us to understand: “hardness”, “obstinacy”, and “seduction”. A hard heart is a “closed” heart, “that does not want to grow, that defends itself, that is closed in on itself”. In life this can happen because of many factors; as, for example, a “great sorrow”, because, as the Pope explains, “blows harden the skin”. It happened, he said, to the disciples of Emmaus, as well as to St Thomas the Apostle. And whoever remains in this “bad attitude” is “fainthearted”; and a “cowardly heart is perverse”: We can ask ourselves: Do I have a hard heart, do I have a closed heart? Do I let my heart grow? Am I afraid that it will grow? And we always grow with trials, with difficulties, we grow as we all grow as children: we learn to walk [by] falling. From crawling to walking, how many times we have fallen! But we grow through difficulties. Hardness. And, what amounts to the same thing, being closed. But who remains in this? “Who are they, father?” They are the fainthearted. Faintheartedness is an ugly attitude in a Christian, he lacks the courage to live. He is closed off. Ideology is a [kind of] obstinacy. The Word of God, the grace of the Holy Spirit is not ideology: it is life that makes you grow, always, [that makes you] go forward, and also opens your heart to the signs of the Spirit, to the signs of the times. But obstinacy is also pride, it is arrogance. Stubbornness, that stubbornness that does so much harm: closed-hearted, hard – the first word – those are the fainthearted; the stubborn, the obstinate, as the text says the ideologues are. But do I have a stubborn heart? Each one should consider this. Am I able to listen to other people? And if I think differently, do I say, “But I think this...” Am I capable of dialogue? The obstinate don’t dialogue, they don’t know how, because they always defend themselves with ideas, they are ideologues. And how much harm do ideologues do to the people of God, how much harm! Because they close the way to the work of the Holy Spirit. Finally, in order to help us understand how not to slip into the risk of having a perverse heart, the Pope reflects on the word “seduction”: the seduction of sin, used by the devil, the “great seducer”, “a great theologian but without faith, with hatred”, who wants to “enter and dominate” the heart and knows how to do it. So, concludes the Pope, a “perverse heart is one that lets itself be seduced; and seduction leads him to obstinacy, to closure, and to many other things”: And with seduction, either you convert and change your life or you try to compromise: but a little here and a little there, a little here and a little there. “Yes, yes, I follow the Lord, but I like this seduction, but just a little...” And you’re starting to lead a double Christian life. To use the word of the great Elijah to the people of Israel at that moment: “You limp from both legs”. To limp from both legs, without having one set firmly. It is the life of compromise: “Yes, I am a Christian, I follow the Lord, yes, but I let this in...”. And this is what the lukewarm are like, those who always compromise: Christians of compromise. We, too, often do this: compromise. Even when the Lord lets us know the path, even with the commandments, also with the inspiration of the Holy Spirit, but I prefer something else, and I try to find a way to go down two tracks, limping on both legs. The Pope concludes, “may the Holy Spirit, therefore, enlighten us so that no one may have a perverse heart: a hard heart, which will lead you to faintheartedness; a stubborn heart that will lead you to rebellion, that will lead you to ideology; a heart that is seduced, a slave to seduction”.